The present study intends to empirically test how often and who with the world's politicians, countries and capitals appear in the online editions of two Hungarian dailies - Magyar Nemzet (MNO) and N�pszabads�g (NOL). Our analysis focussed on the period preceding the EP elections in 2014 considering that, as a matter of course, these elections were not concerned with domestic issues - at least in principle - but with cross-border European themes. We collated all the articles that had the names of 200 countries and capitals, as well as of those of 494 state or government heads, in the aforementioned media between 1 January and 17 May 2014. This list was complemented with the names of 13 well-known EU politicians. 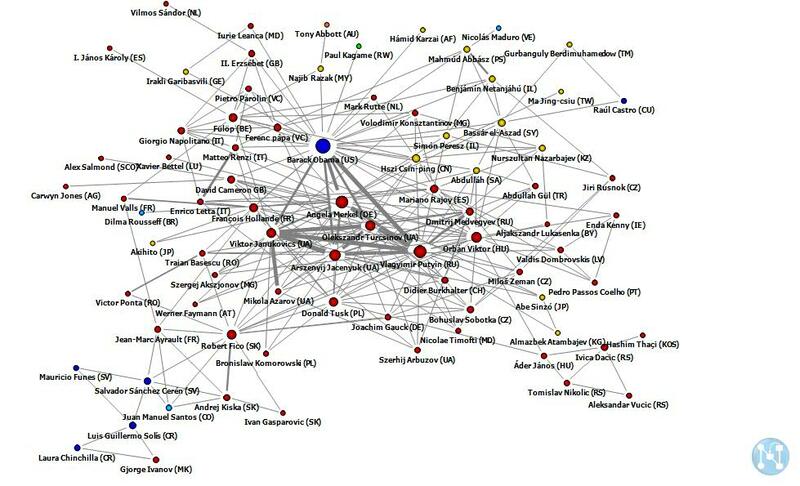 The networks of players have been drawn up on the basis of the appearances of politicians and countries in the press. 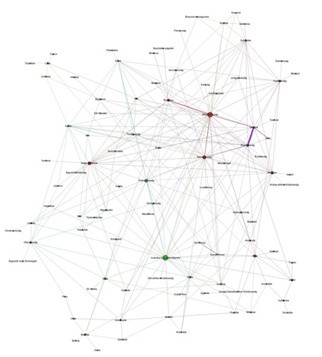 Thus the nodes of networks are represented by names of countries or politicians that appeared simultaneously in a given article. We understand this mentioning in relation to a connection within the network. Of course, many kinds of contexts may be behind these. It could be the connection between two entirely neutral 'points', e.g. in the case of a list, but it could also be positive or negative. At the same time, the EP elections provided a good opportunity to identify and examine in a broader sense which foreign politicians and countries appear in the Hungarian daily press. Hungary held its EP elections following her own general election, which took place in April 2014. The cumulative number of articles about the EP elections shows (Diagram 1) that initially the issues were pushed into the background because of the general election in April, and they received proper attention only after that election had been conducted. As is well-known, participation was at a record low level in Hungary and several other countries. We presume that one of the reasons is that it is difficult to have the electorate go to the ballot box twice in such a short period of time. In Lithuania the head of state was elected on 11 May, then altogether 21% participated in the EP elections. Otherwise, the rate of participation in the EU as a whole did not change compared to the elections five years previously (43%). In six countries participation increased even significantly (above 5 percentage points). 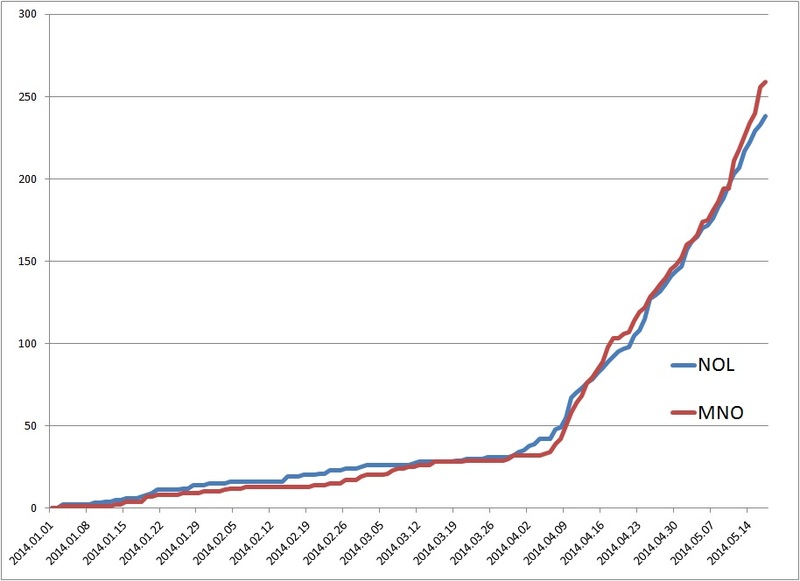 Due to the local elections in Greece, participation even grew by 5%. 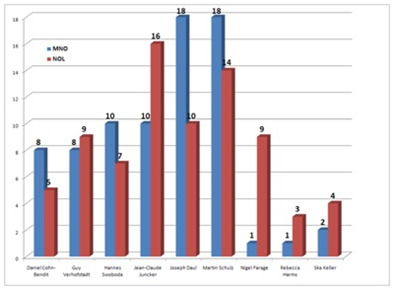 The number of references to the EP's leading politicians and candidates in the articles was extremely low during the EP campaign (Diagram 1-2. ), although three politicians - Martin Schulz, President of the European Parliament between 2009 and 2014, Joseph Daul, Chairman of the European People's Party, and Jean-Claude Juncker, the People's Party candidate for EU Commission President - stand out from among the players. Besides them, however, only Cohn-Bendit, Swoboda and Verhofstadt appeared in more than ten articles in the two dailies. 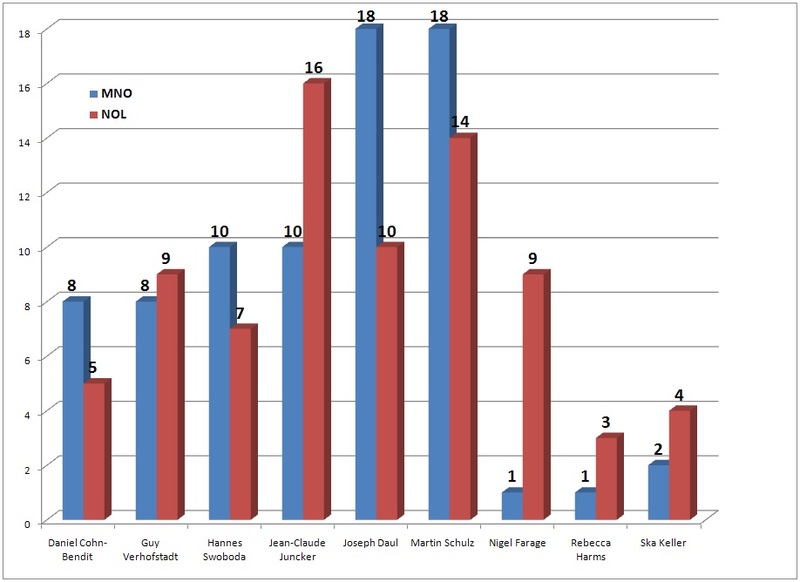 Of the other two participants (besides Schulz, Juncker and Verhofstadt) in the large-scale TV debate between the candidates for Commission President, the highest post in the EU, Ska Keller appeared in articles in MNO only twice and in four articles in NOL, while Alexis Tsipras occurred not even once in the two Hungarian political dailies during the EP campaign. Moreover, not only Tsipras but neither the current leading politicians of Greece are present in the Hungarian media. After the politicians of the EU, let us cast our eye further afield. First of all we took only those articles of the two dailies into account in which a maximum of two politicians were mentioned and we focussed only on appearances presenting the broadest picture within the foreign political column. The network of states and government heads shows that besides the leaders of the great powers - Obama, Merkel and Putin - Hungarian PM Viktor Orb�n, Yanukovych and Yatsenyuk, i.e. Ukraine, appear with greater emphasis. 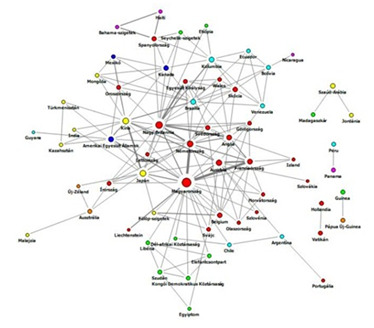 These mentioned are present in the Hungarian press as central players who have bilateral connections with many politicians and their connections are strong, i.e. they appear in joint articles on several occasions. An interesting difference is that while Putin has six exclusive connections in NOL, he has only one (with Lukashenko) in MNO. And, for example, J�nos �der, President of the Hungarian Republic, has only one exclusive connection (Viktor Orb�n) in MNO, while he has several connections in NOL. 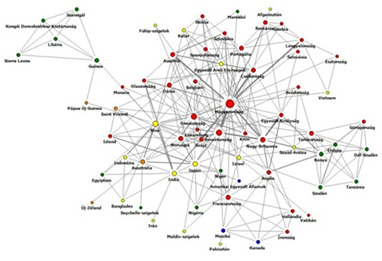 Moreover, in MNO there are nine pairs of politicians who have (exclusive) connections only with each other. If we not only analyse articles with bilateral connections but also those that mention from two to five politicians, the crisis in Ukraine and its affected players tend to come into more prominence. This network is far larger and denser. Six players - Obama, Merkel, Putin, Yanukovych, Turchynov and Yatsenyuk - are in the focus in the case of both dailies (Diagrams 3 and 4). In both papers the strongest connection could be found between the president who resigned, Yanukovych, and the newly appointed head of government Yatsenyuk, although the bond was twice as strong in NOL. 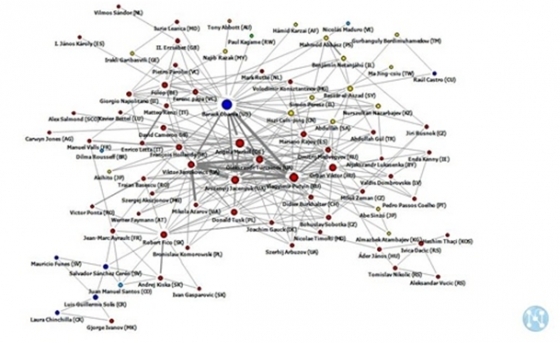 Others, such as Donald Tusk, Dmitry Medvedev and naturally Viktor Orb�n have a high number of connections. We examined the similarity (correlation) of the two dailies' networks with statistical methods and found that considering the whole the two networks do not significantly differ (by and large, the number of nodes and edges also correspond). It can be highlighted as a specific difference that the number of J�nos �der's connections in this larger network is significantly different in the two newspapers. While in Magyar Nemzet the Hungarian head of state appears at the perimeter of the politicians' network, in N�pszabads�g he is in a more central position and has twice the number of connections. With the exception of Merkel, in the network Europe and EU politicians (at least with respect to heads of states and governments) are peripheral players in the EP election campaign. The foreign political focus in the papers is clearly dominated by Ukraine, namely it can be stated that the press cannot or does not want to pay twofold attention, at least with regard to connections of politicians. 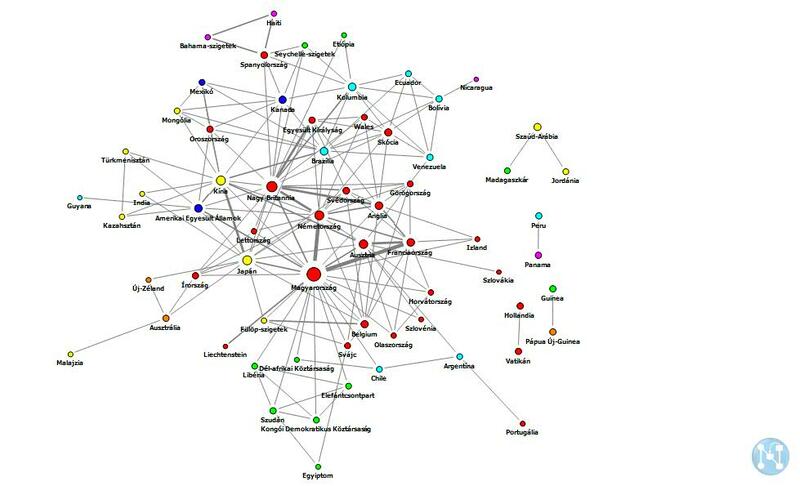 Key: The larger nodes indicate how important a connection node the given politician represents in the network (on the basis of PageRank). Nodes of identical colour indicate the politicians of a continent or region. The international abbreviations of countries are also shown after the politicians' names. The thickness of lines (edges) indicates how many times two countries appear together. In the case of a thicker line, the given two countries are mentioned together more often. We also wanted to know what maps are produced by these two media products when connections between countries are examined. When detecting appearances together within an article, both countries and their leading politicians were taken into account. Let us start with the column of foreign affairs, but since these sections cannot be clearly matched in MNO and NOL, in the case of the former the articles under 'Across the Border', 'EU' and 'Asia' were also included in the analysis. What leaps to the eye at first sight is that NOL is far more active in relation to foreign affairs. Nearly one and a half times as many connections were included in the network via N�pszabads�g,and a total of 7819 connections were analysed. Initially we again only examined bilateral connections, i.e. articles which involved only two players (Diagrams 5 and 6). The significance is that where merely two countries and their politicians appear the connection of the players is far more emphatic as compared to articles including numerous politicians and countries. As could be expected, both newspapers had the Ukrainian crisis in the foreign political focus and the countries which participated in the crises also came into prominence. 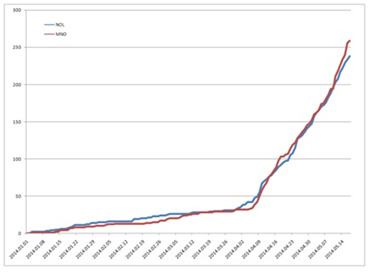 The two dailies place Hungary in the Brussels-Russia-Germany network of relations. In addition, both media emphatically deal with the relations between Hungary and her neighbours, and within that mostly Romania and Slovakia have great significance. We do not claim that if these columns were examined at any other time the same picture would be gained, since in the period under review not only the crisis in Ukraine but also the presidential elections in Slovakia were current. So far a similarity was seen, but let us also examine the differences. At a glance the 'world' of the two newspapers is significantly different. In MNO, besides the USA Hungary is the central player, while in NOL no country emerges to such a degree. In MNO relations between Hungary and Serbia, as well as Hungary and Poland, are present more powerfully, while in NOL it is rather the relations between Hungary and Romania, and even the relations between Hungary and Israel that also appear, something which is absent in MNO. 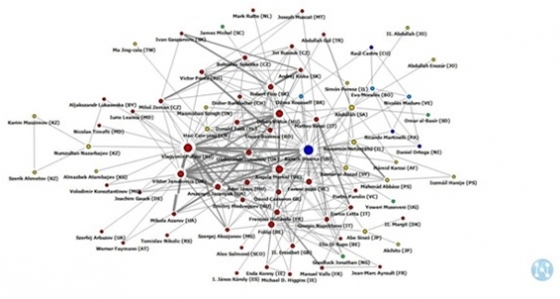 It is interesting to note how the various great powers are positioned in the networks. NOL has Germany appear more emphatically in the bilateral relations, she is in a central position among European countries and she has bilateral relations with both the European great powers and the USA. By comparison, in the case of MNO Germany has altogether four bilateral links and, for example, no bilateral relations can be found between the Germans and Brussels. Yet this does not mean that the role of Germany would be less important in MNO (Diagram 5). The world network of Magyar Nemzet is less frequent, i.e. countries are connected to one another to a lesser degree than in NOL (Diagram 6). It is important to call attention to the role of the USA, which is not significant in her connection with Hungary but represents the most important node in that she best links the various parts of the network. In everyday language this means that the USA is present everywhere. Hence she is unique in the network, because although Russia, China, Brussels and Germany are also important, their connections mostly appear on a regional level, while the USA has bilateral relations which include a wide range of countries such as Bolivia, Rwanda, India and Holland. An interesting difference can be discovered in the position of the Vatican. In NOL (Diagram 6) the Papal mini state does not play an extremely important role, yet in MNO (Diagram 5) it has several bilateral relations and its connections are diverse, representing an important connecting link in the network. 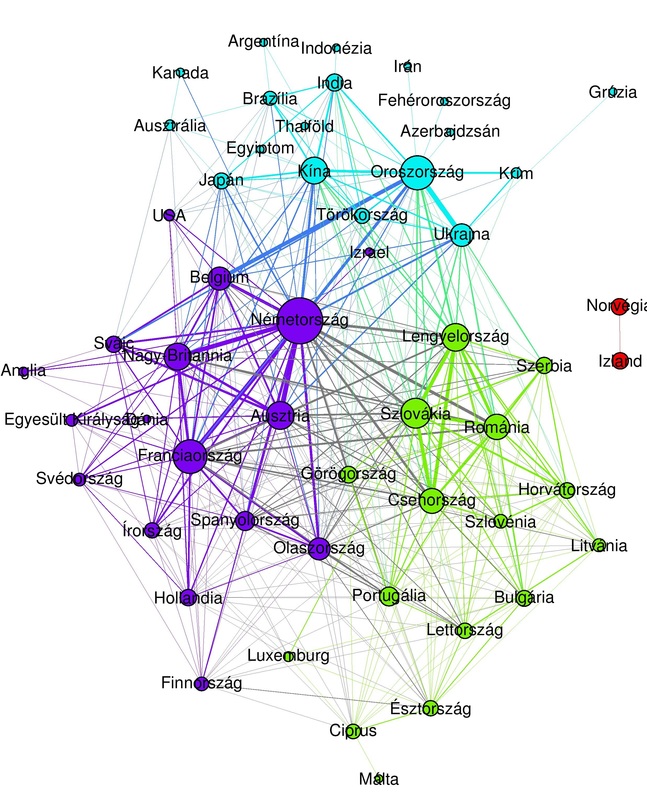 Key: The larger nodes indicate how important a connecting node the given country represents in the network (on the basis of PageRank). Nodes of identical colour belong to the same group, so they establish some kind of unit according to their connections. The thickness of lines (edges) indicates how many times two countries appear together. In the case of a thicker line, the given two countries are mentioned together more often. The above described picture changes much if we take into consideration again those articles which mention players of several countries. In this case articles were analysed involving up to eight players at most. The United States of America continues to represent the centre. With respect to Europe, the political space is organised around Germany, France, Great Britain and Belgium (Brussels), with Germany being the strongest, most important player in both newspapers. Poland appears in an important mediating role in the Ukrainian crisis. The articles reflect this, since Poland is strongly linked to the Russian-Ukrainian-Crimean trinity. In connection with the Ukrainian conflict, Georgia and Moldavia also surface in NOL, while these same connections have a weaker appearance in MNO. In both papers China is the most dominant player among the Asian countries. An Asian grouping (cluster) is practically organised around her, of which Australia also constitutes a part. This is mostly due to the disappearance of the Malaysian passenger aircraft and the articles about the search for the plane, in which Australian search teams actively participated. With respect to Hungary, the Visegrad Group shows up to a certain extent in the network of NOL, but it is less apparent in MNO. 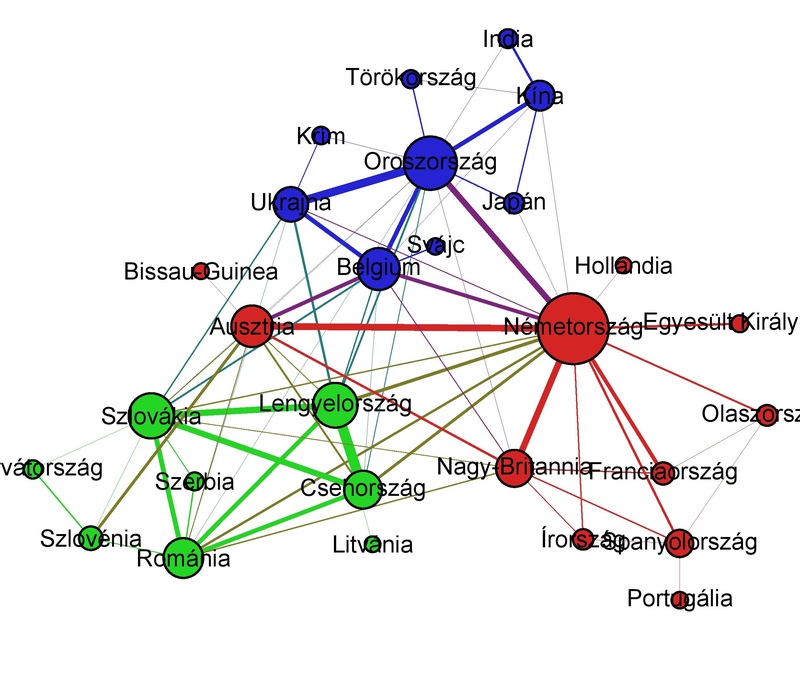 Another difference in the two papers is that Hungarian and Russian connections appear together in more articles in N�pszabads�g than in Magyar Nemzet, in which they are not too emphatic. Presumably, the reason can be found in articles about the Paks nuclear power station. It can be clearly seen that Africa is extremely far from Hungary. It is farther than North Korea, at least on the basis of press news. African countries are practically absent from the network. Nevertheless, we tried to somehow find Africa and in order to do so we screened the columns on domestic affairs and the economy, assuming Europe's southern neighbour might be hiding there. We found Guinea-Bissau, which was present to a significant degree in the domestic column in both dailies. The traces then led from Guinea-Bissau to as far as Panama, which can be attributed to an interesting linguistic matter, since our search involved the names of countries and politicians of countries. In the case of Panama, the name of the country in Hungarian also often has another meaning, 'swindle', which was linked to Guinea-Bissau. Interestingly Guinea-Bissau occupies a less prominent place in NOL that in MNO, i.e. the latter considered the issue a far more important matter than N�pszabads�g. What is happening without Hungary? 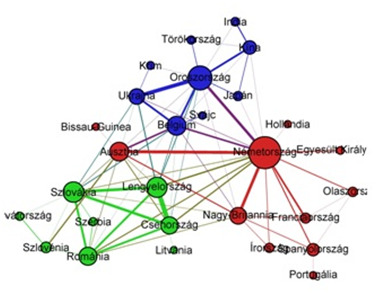 Obviously, Hungary's appearance in the domestic and economic columns is so frequent that she strongly dominates the structure of the network in an extreme manner. What we wanted to discover was what these two media present from our standpoint, therefore, like the skilled players of a shooting simulator game, we took out our own bodies from the visual field and examined what network developed without Hungary. In the case of NOL three large blocks (clusters) can be seen (Diagram 8). The result was an Eastern European cluster dominated by Poland, Serbia, Romania and Slovakia, but this cluster includes the Baltic states, moreover Portugal and Greece. The other large group consists of the richer part of Europe, as well as the USA and Israel, between which no connections are found here. So it can be said that articles in NOL seem to follow the income/economic differences between European countries, and countries seem to appear together on that basis. The exception is Luxemburg's inclusion in the 'eastern group'. The third large group is defined by Russia and China. This is the group where actually all countries outside Europe are included. MNO presents a smaller network (Diagram 7) with fewer connections and fewer players. Very simply, MNO's columns on domestic affairs and the economy have foreign players together with Hungarian or other foreign players less. 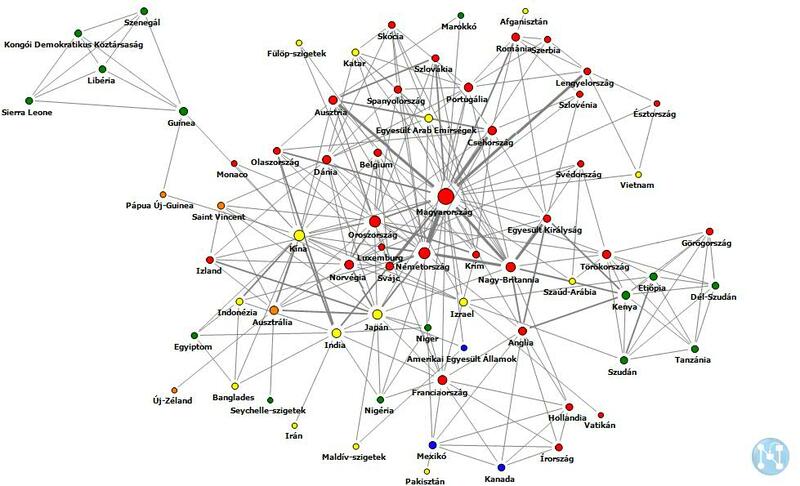 We have taken Hungary off the diagrams and in the interest of lucidity a simplified view of the network is shown (we have indicated only those countries which appeared together at least five times in the period under review). 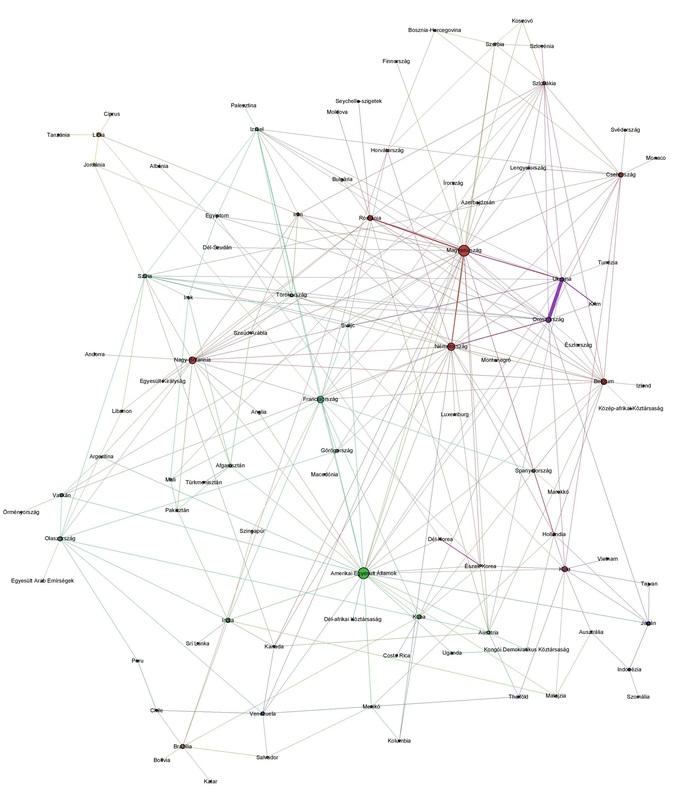 Key: The larger nodes indicate how important the given country is in the network. Nodes of identical colour belong to the same cluster, so they establish some kind of unit according to their connections. The thickness of lines (edges) indicates how many times two countries appear together. In the case of a thicker line, the given two countries are mentioned together more often. With the aim of further consideration, let us examine the networks of another column in the two dailies. 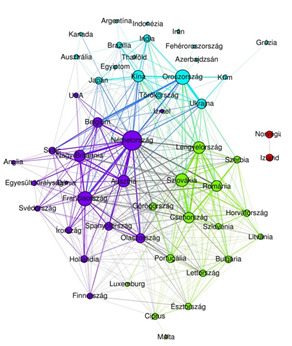 In the case of the science column, the networks are clearly focussed on Hungary (Diagrams 9-10). 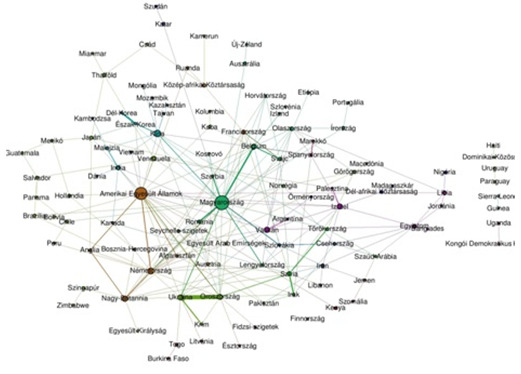 The number of Hungary's connections is different in the two papers - she has 25 connections in MNO, while the number is 34 in NOL. Overall however, the two networks do not show any essential difference, either in the number of elements or the presented countries. With regard to continents, science is clearly focussed on Europe, the connections are rather within a continent than spanning continents. Martin Schulz, Guy Verhofstadt, Daniel Cohn-Bendit, Hannes Swoboda, Joseph Daul, Rebecca Harms, Micha� Kami�ski, Lothar Bisky, Nigel Farage, Francesco Speroni, Jean-Claude Juncker, Alexis Tsipras, Ska Keller.